Nothing lives beyond the garden where Wren and her fellow creations live, but that is okay. They have everything they need – shelter, food, company, and a gorgeous environment – all thanks to their creator, Dot. Life is perfect. Or is it? Wren is having strange thoughts and odd sensations of having been places outside of the garden. She is remembering strange words and people who aren’t part of Dot’s creation. Fellow creation Blaze also seems uneasy while Gil is determined to crush anything and anyone who challenges Dot’s teachings. How long can Wren’s faith hold out when every day brings fresh challenges that force her to acknowledge that things aren’t as perfect as they seem? 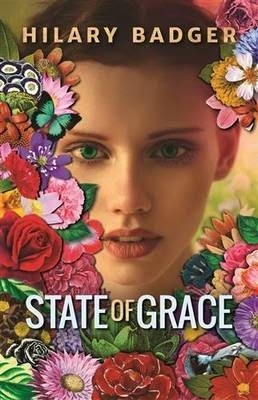 On the most superficial level, State of Grace is a romance and story of self-discovery as Wren struggles with her attraction to the enigmatic Blaze and her growing awareness that there is more to the world than what is contained within the walls of the garden. On a deeper level, the novel is a study of human nature as the group of teenagers is isolated within the walls of the garden and left to monitor themselves and each other in accordance with the guidelines shared in the Books of Dot. The novel also has obvious themes related to faith and organised religion, social expectations and taboos, and other issues that it is difficult to mention without spoilers. It should be noted that there are sexual references within the text, including references to (but not descriptions of) non-consensual sexual acts. I found the story started a little slowly as the setting and characters were established, however as I moved into the second half of the book, I was drawn in by the complex moral questions that were being raised. Some of the language used also took a little while to get used to, with Dot instructing her creations to focus on positive words, hence the use of precalm rather than scared, prelight rather than dark, and prehappy rather than sad. I struggled a little with some aspects of the story, with several questions about the logical consistency of life within the garden and no real sense of connection with the central character, Wren. I did, however, really appreciate the questions raised about social issues very relevant to teen readers. I thought the concept of the story was quite interesting and, a week after finishing the book, I am still thinking about some of the questions the story raised. The lack of action and slower pace of the novel may mean that it doesn’t appeal to the general dystopian teen audience, however State of Grace is sure to connect with those readers who enjoy a novel that raises deeper issues and opens the way for debate about society and human nature.